The open and close range are represented by rectangle called the real body (black for a close under the open, white for a close over the open). 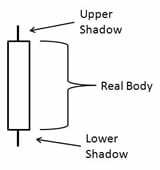 The lines above and below the real body are called shadows. The top of the upper shadow is the session high and the bottom of the lower shadow is the session low.